AARP surveys indicate that almost 90% of those over 50 want to stay in their homes indefinitely. In light of that trend, AARP and NAHB (National Association of Home Builders) have developed the Certified Aging in Place Specialist (CAPS) training program to educate builders and remodelers on ways to make a home safer and more workable for homeowners at any age. “Universal design” is another term used when referring to homes modified to meet the needs of older persons or the handicapped. The most popular installations have been bathroom grab bars, higher toilets, curb less showers, widened doors, ramps and lowered thresholds. 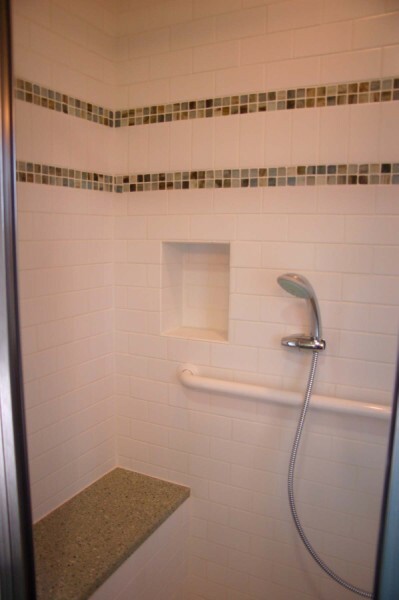 Not everyone who incorporates universal design concepts in remodeling is doing it specifically for aging in place; some want to accommodate disabled friends and relatives or provide the option to easily install additional modifications when they get older. The cost of aging in place renovations is variable, but many times they are similar in price to more traditional design. A complex adaptation, like a curb less shower, might be a bit more expensive. It is usually much less costly to do a remodel as a universal design or CAPS style, than to have to tear it out and make changes later. Aging in place tends to focus on assistive adaptations for those who want to maintain their privacy and autonomy as they age. These adaptations include changing doorknobs to lever type and light switches to paddles for easier use by those with arthritis; eliminating carpeting and variations in floor height for easier walker and wheelchair use and creating greater contrast in lighting to make it easier to see the task at hand. 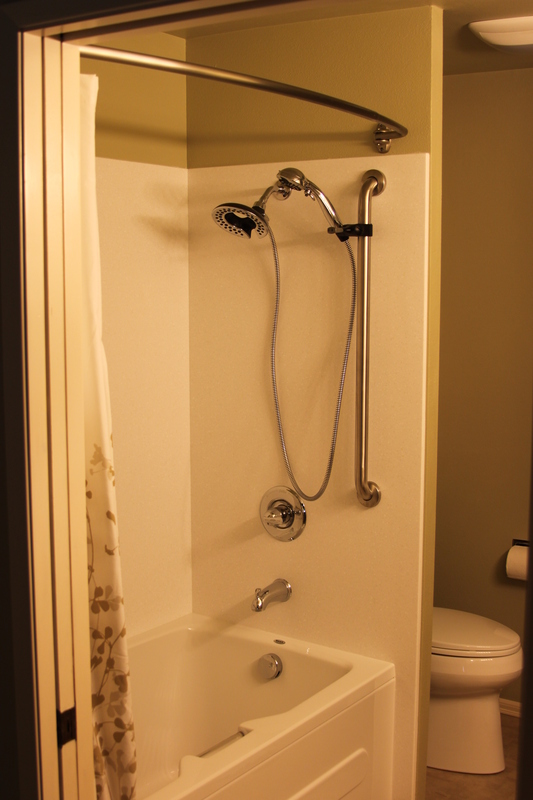 There are several grab bars we installed in this tub/shower. If you or a loved one is having a difficult time staying in their own home, but wishes to remain independent, what can you do? CAPS (Certified Aging in Place Specialist), and Universal Design were developed to provide solutions to this dilemma. When a contractor who is a Certified-Aging-in-Place Specialist is called in to assist in determining what changes need to be made to the home, he or she will perform an audit. This audit includes a floor plan, dimensions of areas being used, and capacities, conditions, and limitations affecting potential construction or modification. This information plus information from the client’s health care professional is used to make an evaluation and define a scope of work. While still governed by applicable building codes, the CAPS trained contractor is free to offer a range of solutions aesthetically pleasing to residential clients over the more sterile, hospital like approach of the pure accessibility design seen in commercial construction. Knowing what equipment and materials are available for those with accessibility issues is part of the training and body of knowledge the CAPS professional has at his fingertips. A bathroom, for instance, can be re-designed to accommodate a person with accessibility or stability issues, and still be stylish. We have experience and training in helping clients upgrade bathrooms to make them more accessible. Give us a call if you would like to see what we can do to upgrade your bathroom. If you don’t require a fully CAPS designed bathroom, consider incorporating universal design. It is intended to ensure that a project is useful for people of all ages, abilities and sizes. Among the upgrades: Replace lower toilets or sinks with taller options that require less stooping or bending; replace bathtubs with low-threshold showers that have seats and grab bars. Faucets with blade-style handles work better for those with problems with manual dexterity. 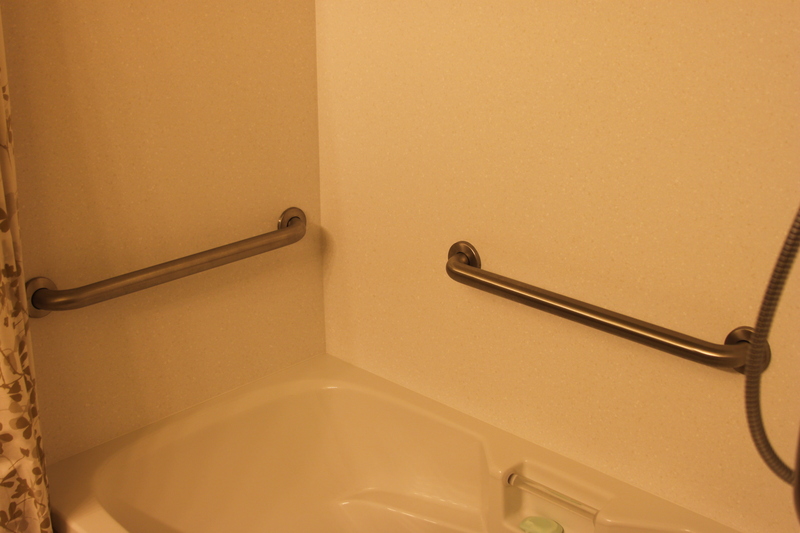 Stylish tile trim, built in seat, grab bar and hand held shower wand.